Sometimes it is okay to be a little cheesy with your kids. 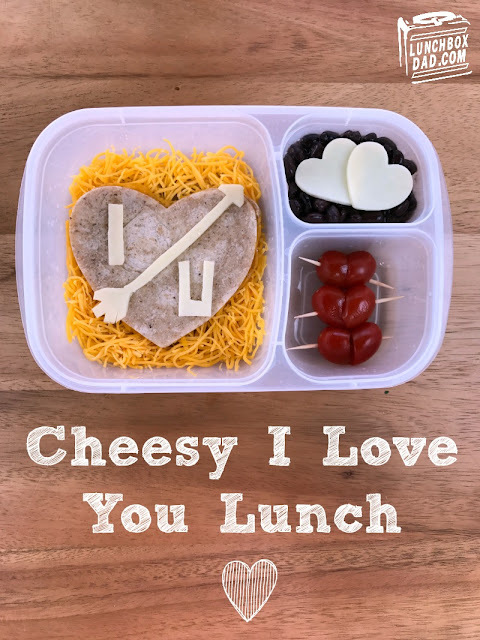 A lunch that says I love you is one of those times. 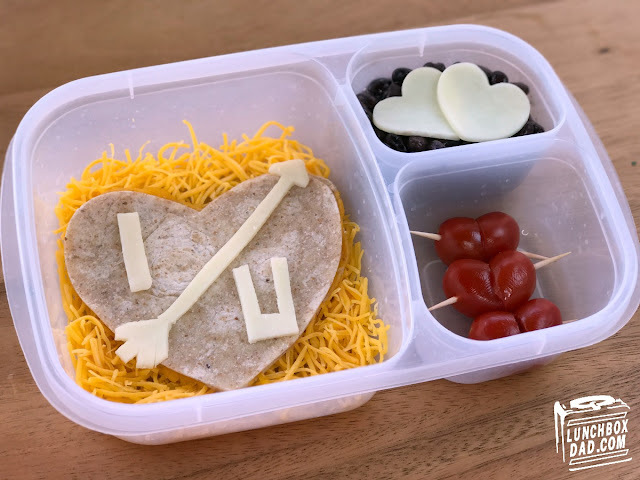 I have done heart themed lunches in the past for Valentines Day, but I wanted this one to be a bit different. My goal was to make this one be half build your own, and the other half designed in a fun way. So this is actually a cheesy quesadilla and beans lunch. It will be interesting to see how my kids will react to this theme because, although they enjoy this type of food, my son usually doesn't go for the "mushy" themed lunches. He loves Star Wars, Super Heroes, and sports lunches but I think it is important to show some affection towards your kids. Normally this is done in a lunch note that I write, but I think he will appreciate this, even if he won't admit it. 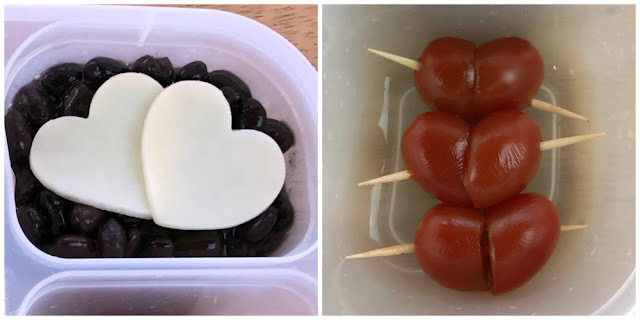 I made this in an Easy Lunch Boxes container and I cut grape tomatoes in 45 degree sections, then put the sections together to form hearts! See how I easily made the rest below. Ingredients: Whole wheat tortillas, shredded cheese, white sliced cheese, black beans, grape tomatoes, toothpicks. 1. Use a heart shaped cookie cutter to cut tortillas into two heart shapes. Stuff with shredded cheese and heat up in the microwave so cheese melts. Drop more shredded cheese into main compartment of lunchbox and place heart quesadilla on top. Your child can heat it up at school or eat it cold. It is up to them! 2. Cut arrow shape and the letters "I" and "U" from sliced white cheese. Place on top of quesadilla. 3. Spoon black beans into side dish. Use small heart shaped cookie cutter to make two small cheese hearts from sliced white cheese. Place small hearts on top of beans. Put in side compartment. 4. Prepare grape tomato hearts as explained above. Place in second side compartment. 5. Your kids can drop extra cheese in the beans, dip their quesadilla in, or eat it all separately. The choice is theirs. Lastly, remember to tell your kids that you love them!